It must be at least 2 decades ago since I last ate Sweet Potato Balls. I knew of only one place where it can be found and I have not been there in a long, long time. Sold by a vendor at a corner of Petaling Street, Kuala Lumpur’s Chinatown, these golden orbs were such a treat. He was constantly frying a whole wok of them in hot oil. They were so delicious fresh out of the wok. I remember going to Petaling Street with mom for Chinese New Year shopping. We would set out after the morning rush hour to take the mini bus downtown. Mom would not drive because parking was a problem. It was always hot and humid with throngs of people. Shoppers would be haggling over the prices of everything from clothes to groceries. Others were just milling around and eating as they went along. Thankfully, there were no shortage of street vendors and restaurants to keep everyone full and contented. One could snack on bak kwa (Chinese pork jerky), coffee roasted chestnuts, boiled peanuts, fried popiah (spring rolls), rojak (Malaysian spicy fruit salad), and of course these golden and delicious Sweet Potato Balls. Freshly squeezed sugar cane juice with ice and cold sweet longan drink quenched the thirst. For lunch, a bowl of Wonton Noodles at the renown Koon Kee restaurant was a must. Their springy wonton noodles were considered the best. They also served delicious Sui Kow (Chinese Dumplings) with mustard, a sauce seldom offered, if ever, by other restaurants. Ahh, those were good memories! 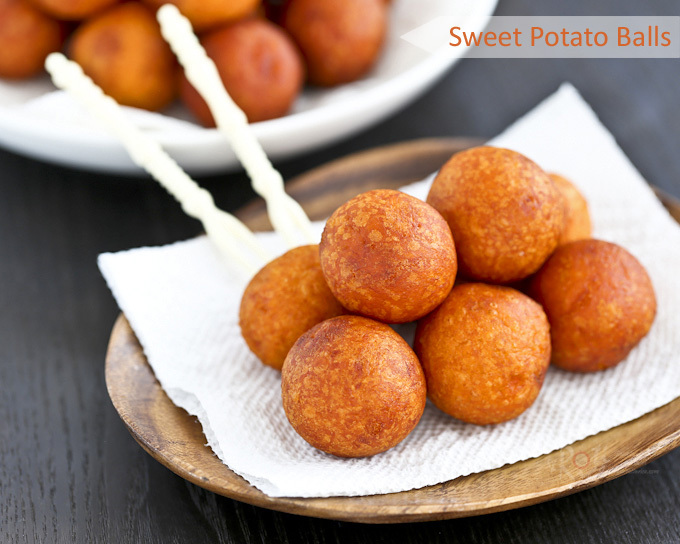 Now, back to our Sweet Potato Balls recipe. I used glutinous rice flour to give them a slightly chewy bite together with white rice flour to keep them gluten free. Swap out the glutinous rice flour with tapioca starch for a softer version. Always remember to deep fry these in medium low heat as they burn easily. It takes about 3 to 4 minutes for 1 inch diameter balls. They will float in the hot oil when cooked. Do give it a try. Peel and cube sweet potatoes. Place in a steamer and steam for 10 minutes until soft. Transfer to a large bowl and mash with a potato masher. Add glutinous rice flour, white rice flour, granulated sugar, and baking powder to the mashed sweet potatoes. Mix with a spatula until a soft dough forms. If dough is still a little wet, mix in some additional white rice flour. Dough should be soft but not sticky. Pinch a little dough from the bowl and roll between palms to form a 1-inch diameter ball. Repeat until all dough is used up. Fill a medium sized saucepan with 1 inch vegetable oil over medium low heat. Gently drop a few sweet potato balls into the hot oil. Fry for 3 to 4 minutes until golden brown. Sweet potato balls should float when cooked. Remove with tongs and drain on a metal strainer. 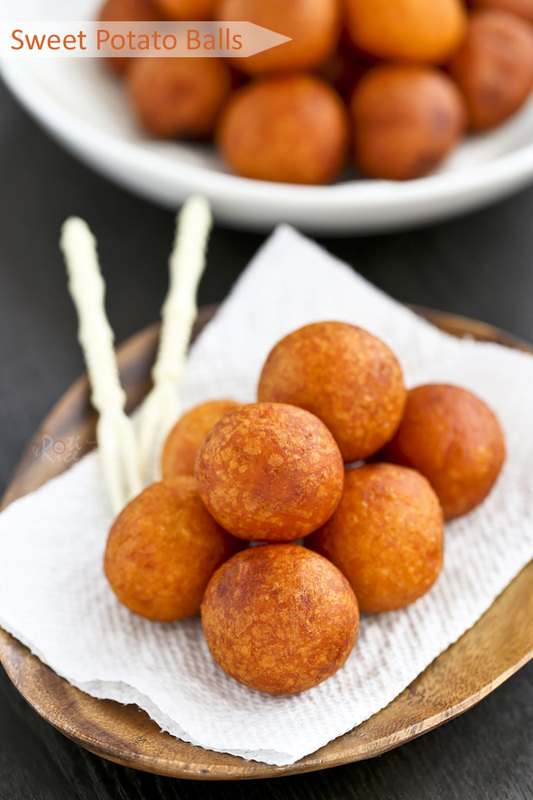 Repeat until all sweet potato balls are cooked. 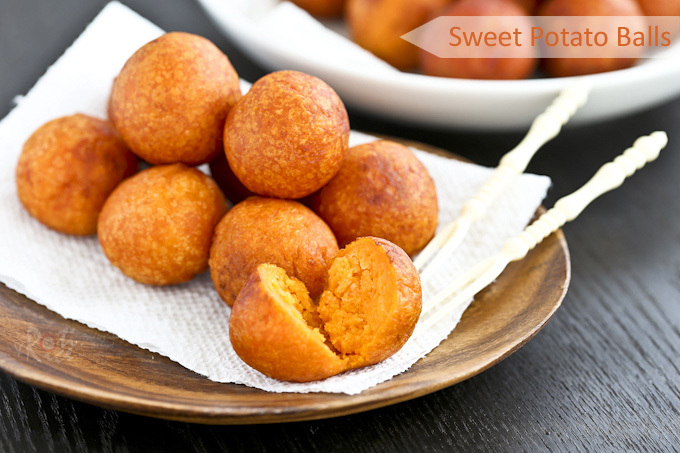 This is a great recipe for sweet potato balls …they keep their shape even when cool and the taste is really good! Thanks Linda….this recipe can be passed on so my grandchildren can enjoy this traditional snack! Yes, you can use just rice flour. 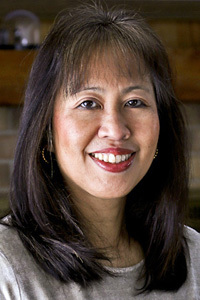 I would not use just glutinous rice flour or they would be too chewy. I have not tried baking them but you can certainly give it a try. You will have to experiment with the temp and duration. Hi! I really want to try these but tapioca starch is hard to come by in my country and so is glutinous rice flour. Would cornstarch work? Thanks! I noticed in the comments that you said it’s okay to use all purpose flour and cornflour/ starch. How much all purpose flour would you recommend to replace both the rice flour? Also in your recipe, there is no tapioca flour mentioned.. If needed, how much is required? Please use 3/4 cup all-purpose flour in place of the rice four. I used 1/2 cup glutinous rice flour (no tapioca starch) in this recipe but it can be replaced with 1/2 cup tapioca starch for a softer version. Instead of the rice flours, could you use almond flour? I have not tried using almond flour but you can certainly give it a try. Thank you Linda for this amazing recipe. My grandmother used to cook this when I was a little girl and this brings back a lot of great memories. I have made this today and it turned out amazing. Thank you! Are those a snack? A dessert? They look so cool, I wonder if they could be a side dish to something…. Can’t wait to try this recipe, looks great! Perhaps I can bring this to potluck Christmas party!! These look delicious! I can’t wait to try them. Is it ok to refrigerate the dough for a few hours before frying them? I think refrigerating the dough for a short time will be just fine. I have not done it but I don’t see why not. Omg I just made these today and they taste soooo good! My whole family enjoyed this as afternoon snack! Thanks very much for sharing this awesome recipe! This is one of my favourites and certainly will buy whenever i am in petaling street. Had tried other receipe which was using rice flour and wheat flour but the texture was quite soft and not to my liking. Will try out your recipe one day. Hi, I tried making these sweet potatoes but mine didn’t end up having a chewy texture in the middle. What could it went wrong? I used two kinds of flour. One is regular rice flour and the other is glutinous rice flour. The latter is the one that gives the chewy texture. I used both types of flour too. My mixture wasn’t sticky too.. isit cause I use too little potato or? Hi can you freeze the balls before cooking. I would like to make about 60 for our next happy hour. I have never tried freezing them before frying but I don’t see why not. You can certainly give it a try.